Welcome to easy-e blog: Julius Agwu Contesting For Rivers State Governor In 2015? 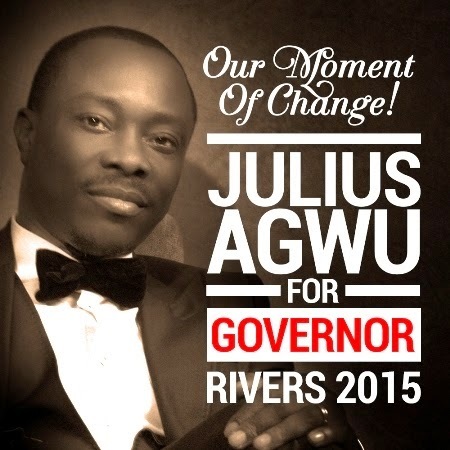 Julius Agwu Contesting For Rivers State Governor In 2015? I saw this picture this morning on a renowned Journalist's display picture on blackberry. I asked him if it was a joke and he said it wasn't: Julius Agwu is contesting for real! ....My party will be unveiled in due course. In any case whether its true or not time will tell. But if it is so, Julius has my support hands down. I have met him first hand and think he is a unbelievably funny and humble. Moreover, its really time Nigerians start adopting change where governance is concerned. We as Nigerians have for many years continued to vote in the same set of clueless people who produce no results and have started to consider governance their birth right. I think its high time we started considering qualified, young Nigerians from different walks of life for governance and leadership. Nigeria is long overdue for change.